What does one say after watching a movie that is 90% good and about 10%...well…not terrible but implausible, even for the fantasy-post-apocalyptic genre? 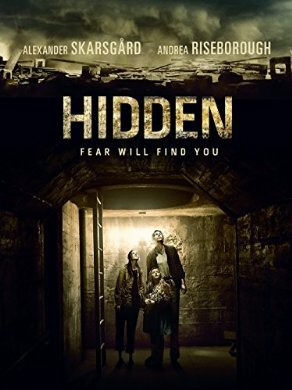 Enter Hidden, a very tense, well-executed concept with an engaging plot that veers into the typical final climactic twist that left me more bewildered than satisfied. Perhaps I am saying too much, but I won’t spoil anything, for I say this as the most subjective of conclusions to a movie’s finale that others may find interesting and refreshing. It is a bit schizophrenic in logic, but the movie is ultimately worth seeing and discussing. First, what it’s about. Alexander Skarsgard, best known for his role in True Blood, sheds a few pounds and his manly physique to play the emaciated Ray, a husband to the pensive Claire (Andrea Riseborough) and father to young Zoe, a typical innocent and often (purposefully) annoying young child played by Emily Alyn Lind. The small nuclear family is living in a bomb shelter enduring unknown fallout after - what is assumed - a virus has killed and reanimated corpses. The three work together to survive on what little they have until, as the movie’s tagline reminds us, fear will find [them]. That fear, as hinted above, is an unknown presence as a consequence of an also unknown fallout. And sure, the best kind of fear is not knowing what you are dealing with. That is how this movie shines. Flashback scenes hint that maybe the “fear” is zombies or similar creature, or maybe the "fear" is a nuclear fallout that has turned civilized human beings into barbarians. We simply do not know. But this also how the movie falters. Save for some excellent performances by the actors, who exude the sweat and blood that perfectly signifies their fears, the movie is essentially a mashup of suitable predecessors. Think The Crazies with a dash of Cormac McCarthy’s novel The Road and its film adaptation. For once the plot reveals why our struggling family must submerge into the earth for nearly 75 minutes of screen time, one wonders if this movie needed making at all. Its potential “message” about humanity and government has already been done not only by the aforementioned but by The Hills Have Eyes and every George Romero zombie movie ever, even that silly John Leguizamo one where the zombies think and rally in union fashion against a rich guy. What you are left with in Hidden is a stylistic, well-executed rollercoaster (although much slower-paced) with no real argument. And that’s OK if that is what you are looking for. Besides, I can see varying opinions on the movie’s climax, which for me is derivative and sometimes laugh-out-loud absurd. But hey, sometimes even the recycled plots need to be thrown back in the bin for a second second-life, if you will. DVD released May 23 in Sweden.